Is Your Money Searching for Sanctuary? Can the Way Advisors Are Cause Conflicts of Interests? Why Does Full Disclosure Seem So Elusive for Investors? 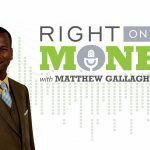 Right on the Money is a financial talk show comprised of an exclusive group of insurance and financial professionals from around the country who have a desire to inform consumers on financial-focused topics that could affect the way they plan for retirement. Have questions or want to get in touch with someone featured on the show? Are you a financial professional interested in being part of the show? © 2019 Creative Marketing International Corp.